Polich Excavating is your choice for your septic system contractor. They have the experience, knowledge and relationships in place for installing your septic system. They will meet you at your project site and help determine the best location for your septic system and how it relates to the rest of your site. The next step is to do a soil test to determine if your site qualifies for a regular septic system, mound or holding tank. You can count on Polich Excavating to help you best determine which system your site qualifies for. Once this is completed any needed permits from the state, county and local municipalities will be obtained for the system that is designed upon your behalf. The final stage is the installation of tanks and whatever type of drainfield that might have been designed. 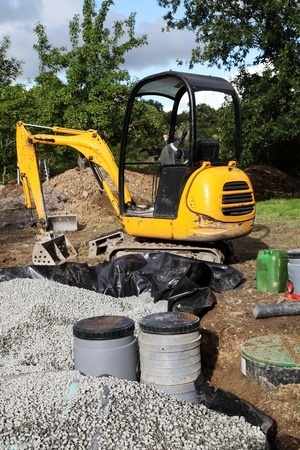 Polich Excavating does both new and replacement systems including, Septic systems, mound systems, at-grade systems, pump up designs and more. Contact them for your septic and sanitary needs.